In February, the now-famous video of a young woman being flogged by Taliban brought women in cities across Pakistan into the streets in protest. Soon after, Islamic law (Sharia) was imposed in Pakistan's Swat Valley. Last week, as President Zardari met with Obama and the Pakistani army bombed Taliban strongholds in the Northwest, another front was taking shape: a civil society movement of Pakistani women protesting "Talibanization." More and more they are taking to the streets, as in this march in Karachi. As a journalist working in international television news, I've been tracking how the world covers women and Sharia. Pakistan has a robust and independent-minded commercial media sector, and the issue is being hotly debated in print and on television. American network news, and news channels around the world, have also covered Pakistani women protesting, but from very different angles. These differences in coverage are juxtaposed in this episode of Global Pulse, a report I produce for Link TV that compares and contrasts coverage on a single story from broadcasters around the world, called Pakistan: Women vs Taliban. While interviewing the young woman activist who speaks in the video, Amna Hamid, our editorial team learned that many Pakistani women have a nuanced perspective, seeing Islamic law not as the source of oppression, although often serving as an excuse for it. Amna says that her mother "of course" supports Sharia, but that when it comes to the Taliban, "the kind of Islam they are imposing...is alien to our culture." Clearly, for these women "Sharia" and "Talibanization" are not seen as one in the same, as they frequently are in the West, and in Western media. In a paper she presented recently, Asifa Quraishi, Assistant Professor of Law at the University of Wisconsin and a well-known expert on women and Islamic law, expresses her frustration with the western perspective saying, "...we [Muslim women] are a topic of feminist attention because Islam itself is considered to be a primary problem standing in the way of feminist work." 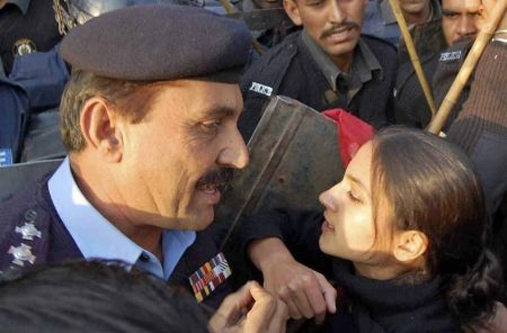 But why has this brutal form of Sharia come to Pakistan? A New York Times report describes swaths of Pakistan where people live as near-serfs in feudal political fiefdoms, where power is concentrated in a few hands and judicial corruption is rampant. The Al Jazeera report we excerpted in Global Pulse illustrates how, in such an unjust system, villagers can be grateful to the Taliban's for their swift dispensing of justice, vicious though it may be. 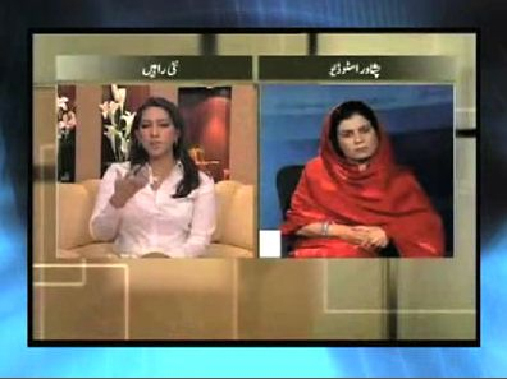 The Global Pulse episode also has a clip from this day-time talk show on Saama TV (in Urdu), a multi-city TV network in Pakistan. A woman interviewer locks horns with a woman politician who defends the Taliban. The contrast between the thoroughly modern interviewer lobbing angry questions, answered by a veiled and smooth-talking politician, is striking. According to a 2005 study by UNESCO, only 28% of Pakistani women are literate, a low number compared to most Islamic countries -- and perhaps, a factor that makes Pakistani women vulnerable to manipulation by those with something to gain from kowtowing to the Taliban. I asked Souheila Aljadda, a fellow producer at Link TV who has written about Muslim woman for USA Today and other publications, what Americans need to know about the difference between Sharia and Talibanization. "Most Muslims would say that what the Taliban is implementing is not Sharia law," she said. "Sharia does not regulate a woman to stay in her home, or force women to remain uneducated." She suggested that women in tribal cultures might seek Sharia, perceiving it as more just than traditional laws that are often extremely biased against women. "Many Muslim women see Sharia as the ideal," she added, "because of Islam's history of social justice." If women in the west want to help the women of Pakistan, perhaps the first order of business is to understand that decrying "Sharia" rather than "Talibanization" could be leading in exactly the wrong direction. Evelyn Messinger is an international television news and documentary producer. Her work has aired on PBS, CBS News, the BBC, French television and others. As Electronic Media Director for the Soros Foundation, she worked in the emerging democracies of Eastern Europe, and as co-founder of the international media rights NGO Internews Network, she worked with independent media in Bosnia, Russia and the former Soviet Union. She is currently the producer of Global Pulse on Link TV.